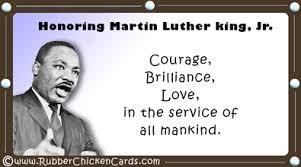 M.L.King Jr. day. | A.B.E. Remodeling, INC.
Greetings, We just wanted to pause and take a moment to reflect on today's federal holiday and repeat the following information shared on google... Martin Luther King, Jr. Day (officially Birthday of Martin Luther King, Jr.) is an American federal holiday marking the birthday of Martin Luther King, Jr. It is observed on the third Monday of January each year, which is around King's birthday, January 15. The holiday is similar to holidays set under the Uniform Monday Holiday Act. King was the chief spokesman for nonviolent activism in the Civil Rights Movement, which successfully protested racial discrimination in federal and state law. The campaign for a federal holiday in King's honor began soon after his assassination in 1968. President Ronald Reagan signed the holiday into law in 1983, and it was first observed three years later. At first, some states resisted observing the holiday as such, giving it alternative names or combining it with other holidays. It was officially observed in all 50 states for the first time in 2000. You may read much more if you do your research. We leave you with this one question that was asked by M.L.King Jr. "What are you doing for others?" We hope that you had a very pleasant day.